Director – Willard Huyck, Screenplay – Gloria Katz & Willard Huyck, Producer – Gloria Katz, Photography – Stephen Katz, Electronic Music – Phillan Bishop, Makeup – Budd Miller, Art Direction – Jack Fiske & Joan Mocine. Production Company – A V/M Production. Arletty travels to the seaside town of Port Dune to find what has happened to her father, an artist, whose letters to her have become rambling and crazed. He is missing and so she moves into his house as she searches for him. She is directed to Thom and his two women who have come to town in search of its occult mythology. After the group are kicked out of their motel, Arletty invites them to stay at the house. All around the town, the dead are returning to life and feeding on the living. As Thom investigates further, he learns of the legend of the dark stranger who came to the town a century ago, bringing the moon of blood, and how the dead wait for his return. Messiah of Evil is a film that has gained a cult reputation. It has remained in obscurity for many years, which is always guaranteed to garnish a film’s reputation as people hang on to second-hand descriptions of it. It was very sporadically released to vhs and not available on dvd until 2009. The film was the directorial debut of husband and wife team of Willard Huyck and Gloria Katz. The same year, Huyck and Katz wrote the screenplay for George Lucas’s first hit American Graffiti (1973). They went on to write the Stanley Donen musical Lucky Lady (1975) and made a couple of forgettable directing-writing outings with the summer vacation comedy French Postcards (1979) and the Dudley Moore comedy Best Defense (1984). Most of their work however has remained in the George Lucas camp, they writing the screenplay for Indiana Jones and the Temple of Doom (1984) and being responsible for Lucas’s two biggest flops, as writers/directors of Howard the Duck (1986) and the writers of Radioland Murders (1994). Neither of them appear to have worked on film since Radioland Murders. Messiah of Evil’s reputation may have been overrated but it is certainly effective, undeniably the best directorial effort that Huyck and Katz have put out. There is an intense strangeness to the atmosphere. The film opens on a haunting voiceover from heroine Marianna Hill as she is locked in an asylum. This is followed by a flashback scene where she journeys to the town and stops at a gas station where a strange albinoid man (Bennie Robertson) turns up and stares at her, while the gas attendant uncovers the back of the man’s pickup truck to find a collection of dead bodies. The father’s house is uniquely designed with the walls a series of photographic montages and paintings that operate as optical illusions hiding doors. Indeed, with its opening narrated by the heroine in an asylum and a series of diary entries by her father that progressively describe how he is losing his sanity and becoming no longer human, Messiah of Evil has very much the feel of an H.P. Lovecraft film. Willard Huyck creates a number of uncanny scenes throughout. There is a very creepy scene where Anitra Ford hitches a ride into town with Bennie Robertson’s albino, only to discover that the back of truck is filled with bodies (it is hard to tell if they are mannequins or dead bodies) while the albino talks about hunting beach rats and then picks one up and starts eating it. 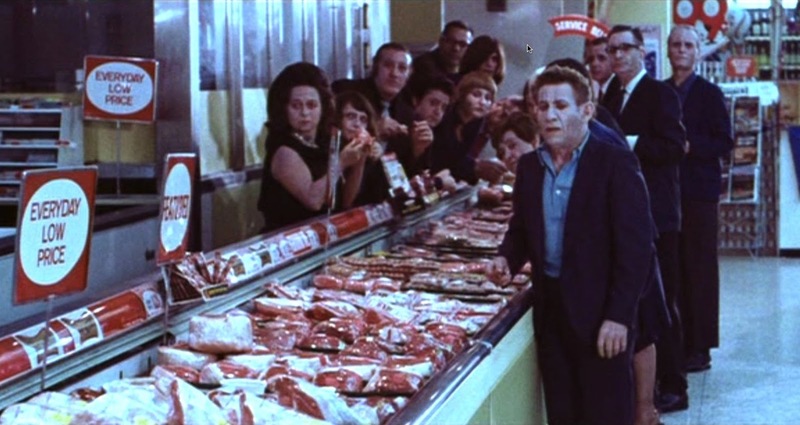 Later Anitra Ford enters a supermarket and comes across the dead eating raw meat, only to be pursued, held down and devoured by them. There is also a great scene where Joy Bang goes to the town’s cinema and sits down to watch the movie and slowly other people come in to sit nearby, she being lit normally and they illuminated in blue before they close in on her with bleeding eyes as she tries to escape but finds the exit locked. Throughout the film, heroine Marianna Hill finds with increasingly unsettling effect that her eyes are bleeding, that she feels no pain when she sticks herself with a pin and that she vomits up bugs. 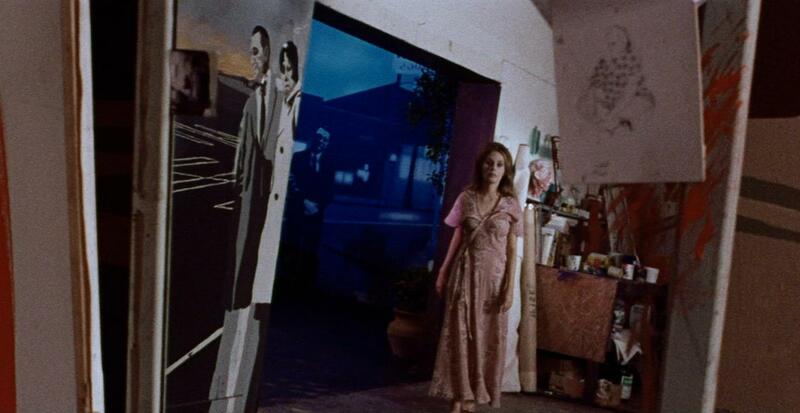 What one liked about Messiah of Evil is Willard Huyck’s strange nightmare ambience. The narrative is not intended as a rational one. Things that happen don’t make sense or come with explanations – there is no explanation for who the dead are, how they came back to life, who the Messiah of Evil is meant to be and so on. For some reason, people are constantly finding themselves in buildings with the exit doors locked, which suggests a human agency aiding the zombies. There is a certain mystery created around the top-billed Michael Greer who appears to have come to town searching out the occult for obscure purposes but nothing is ever explained about him. This places Messiah of Evil into the same boat as other films of the same era such as Let’s Scare Jessica to Death (1971), Dead of Night (1974) and Phantasm/The Never Dead (1979), which exist in a similar strange dream-like state. All of these in turn owe allegiance to the enormously influential Night of the Living Dead (1968).